but i can not find A9WTG60602 licence ??? how can i find it???? Re: [? ]: WINCC key A9WTG60602? Short keyname use only 8 chars. SIFLA9WTG60602 is the licence key is it ok?? Specify all the details when asking questions. Russian wrote: Указывайте все подробности, когда задаёте вопросы. knetknet wrote: SIFLA9WTG60602 is the licence key is it ok?? You read the EKB_Install help ? i try your way but it didn't accept again. I tried to find it in "EKB install.exe" but i couldn't .you can help me ? much! For archive licenses, the new license type "Count-Relevant" is being introduced starting with WinCC V6.2. About license for additional tags for TagLogging. Do You solved this problem? during start WinCC I get message, that I must install A9WTG69999 WinCC Option Archive. I don't find this license. don't install and WinCC run in demo mode. Do someone can help me? The previous advice in this thread don't help me. i installed wincc v7.0. but i dont crack. 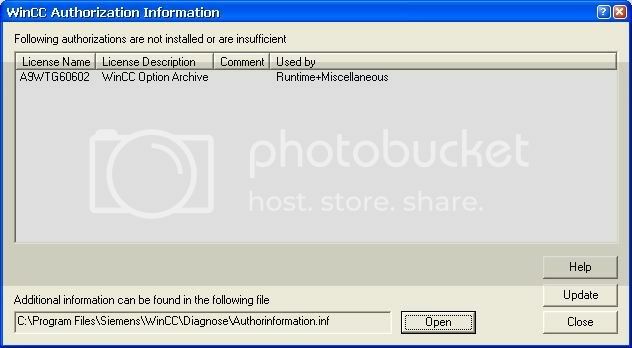 i have Simatic_EKB_Install_2009_08_26. but i have still demo license. which number of ekb can crack? But regardles of what I've install I have still problems with Archive licence. The question is: what more can I do to solve problem ? Install SIFLA9WRC70700 only it's work. I use PCS7 of SP4 version 7.1 (including WinCC v7.0). But License Manager says that everything is OK. I can't find these licenses. I looked for in several EKB including in the last at the moment Sim_EKB_Install_2014_07_28. Has anyone encountered this problem? Please, advise how to solve it.